It was good to meet a "blogging buddy" on Sunday evening for the first time. Shawn Cuthill showed up at Bridlewood Presbyterian in Scarborough to hear me speak. We had a great visit afterwards. Hayley and I had the privilege of hearing David Fisher - click here speak on Sunday night at Bridlewood Presbyterian Church. 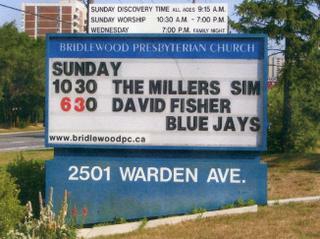 David attends Auburn Bible Chapel in Peterborough, and is the chaplain for the Toronto Blue Jays and Peterborough Petes! It was great hearing about all the Christians in the Jays organization, like Corey Koskie, and how even the coach and GM will call Dave into their office and ask him to pray about decisions they have to make. God has people in all kinds of places!